Football Canada has announced more details regarding the inaugural season of the Canadian Flag Football League (CFFL). 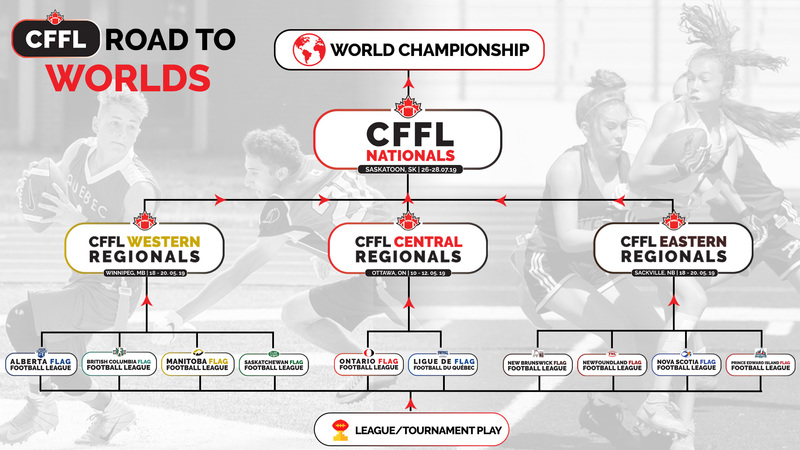 The first regional championship kicks off with the CFFL Central at University of Ottawa from May 11-13, 2019. Soon after, the other two regional championships will be held simultaneously – the CFFL Eastern Championship at Mount Allison University in Sackville, New Brunswick and the CFFL Western Championship in Winnipeg, Manitoba from May 17-19, 2019. At the conclusion of all the regional championships, winners will advance to the final leg of the pathway, the National Championships. It will be held from July 27-29th, 2019 in Saskatoon, Saskatchewan. Prize money will be awarded at each of the regional events as well as the national championships. The winning teams at the Eastern, Central and Western Challenges will get $1500.00 while the runner-up (second place) will get $1000.00. Meanwhile, first place teams at the National Championship will win $2000.00 and the second place finishers will receive $1500.00. Additionally, the CFFL national champion will become the national team that will represent Canada at the 2020 International Federation of American Football (IFAF) World Flag Championship, which will be hosted in South Korea. As previously announced, there will be three leagues in the CFFL – Male, Female and Mixed. All regional and national championships will use the 5v5 rules as per Football Canada’s Non-Contact Rule Book. With this being the inaugural year for the CFFL, Football Canada hopes to achieve many objectives in the first year and build upon that momentum in future years in promoting a strong flag football community.